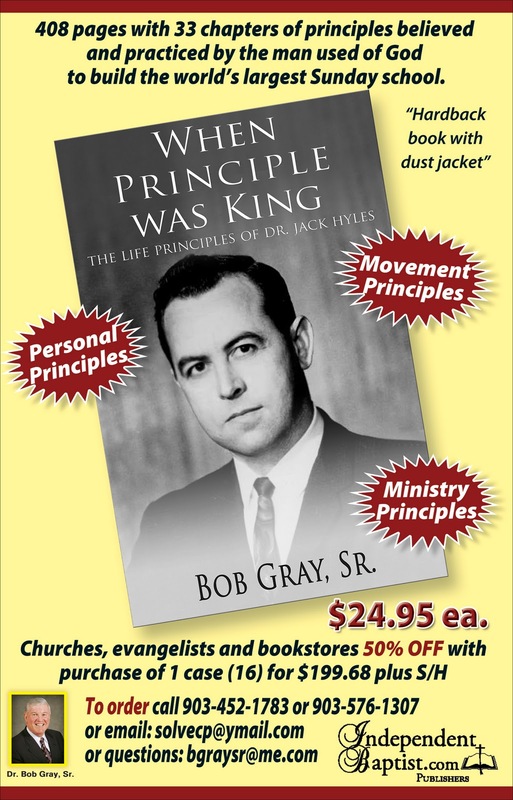 “WHEN PRINCIPLE WAS KING” is a 408 page hard back book with a dust jacket filled with pics of Dr. Jack Hyles. This new book will be coming off of the presses in CA. on December 15. We have a special offer for pastors, churches, evangelists, and book stores of 50% off, which is only good through the month of December. I hope you will take advantage of this offer. The printers will drop ship a case of 16 to your location if you will call now. This will save you 50% of the retail price of $ 24.95. You will be able to purchase the book for $ 12.50 per book, if you take advantage of this offer! Dr. Jack Hyles is one of the fathers of the large church movement in America and was a man who literally infuenced a nation of believers. Over one million souls came to Christ during his 50 year plus ministry with 41 1/2 years of those being in Hammond, IN. It is ironic as I have traveled this nation for 33 years and discovered almost every denomination was influenced by this man of God. I have received orders from Wheaton College, Southern Baptist Seminaries, Southern Baptist pastors, and some Charismatic Colleges. The principles of this man of God are biblical and practical. “WHEN PRINCIPLE WAS KING” is a must read for those who would like to see a move of God again in our great nation. I do not fear for my contemporaries, but I do fear for the next generation coming up who may fall for the modern venue of worldliness and pseudo-academics as bait for a lost world. These principles worked once and will work again! New facilities are being built, big screens are the rage, emerging church philosophy the thing, new Bible Colleges are announced almost weekly, imitation SBC missions, question marks placed on the King James Bible, and all we end up with is a spiritual draught. Read this book of principles and you will see what did work and what will work. GOTTA LOVE THE OLD TIME RELIGION!!!!! !